The great European cities -- and much of the American variety they inspired -- are marked by their great restaurants, places of elegance or intimacy that wrap you up inside, and treat you to an irresistible menu of food and drink. Step through the door of newly open Joselito: Casa de Comidas in Washington, DC's Eastern Market neighborhood on Capitol Hill, and find yourself transported to a bygone world both elegant and intimate, where you'd expect to see Hemingway at a nearby table. Joselito is the picture of charming city dinner cafe, making us feel as if we're looking through the window on Madrid, Paris, or New York as proprietor Javier Candon has managed to bottle the essence of the classic city in this delightful restaurant serving all Spanish food and wine. Don't miss the opening special: Joselito will run a soft opening from Monday 9 January through Sunday 15 January 2017 during which all food is 20% off. Hours during this period are 5:30 to 10:00 in the evening Monday to Wednesday. Normal permanent hours begin Thursday 12 January, Joselito will be open from 11:30 a.m. to 10 p.m. Sunday to Thursday, and from 11:30 a.m. to 12 a.m. on Friday and Saturday. Located at 660 Pennsylvania Avenue SE, Joselito is quite obviously the product of immense and deliberate care from the same restaurateur behind the splendid SER: Simple Easy Real restaurant across the Potomac River in Arlington, VA. The surprise here is not that Javier and the team have produced something so good, but that they have managed to achieve something so different in this new restaurant. Imagine listening to inspired music composed by your favorite painter; a moment in and you suddenly realize that two great, yet very different pieces are the product of the same creator. They share at least one thing in common, though, as I wrote last year about SER, "A tribute to his roots, Javier has built SER around its good people, and seems truly invested in them. In return, they've helped him create the sense that when we walk through the door, we're walking into the closest thing we get to Spain in America." I am proud to share with you my latest labor of love, Joselito: Casa de Comidas. Joselito is an homage to my late father, Jose Candon Perez who together with my mother, showed me that some of the best memories of life are created with family and friends over long, leisurely meals. Indeed, Joselito is a very deliberate effort to take us back in time with enchanting details. Black and white photos adorn the walls rising up to the high ceilings. The marble table tops sit next to wine buckets atop silver pedestals that rise up from the floors, tiles selected and specifically laid to fit the decor. I've been unable to shake the music of decades past since last night's dinner. Then there is the menu. We love that most dishes are available in three sizes of tapa (share these or treat one as an appetizer), media ración (an entree), or ración as a family style portion meant to be passed. We suspect the menu will change often, but for the moment we tried the tapa portions of Queso Manchego Viejo (1 year Manchego cheese, spicy tomato marmalade, and rosemary picatostes) together with Jamon Iberico de Bellota "Capanegra" (Jabugo hand cut black foot Iberian ham and country bread), Raya al Pimenton (skate wing), and Costillar de Cordero Asado (lamb). We tried two of the three desserts: Torrijas (Andalusian style bread pudding) and Sopa de chocolate blanco y fresas al Jerez (warm white chocolate soup with strawberries marinated on Sherry vinegar). All were delicious. We of course opened the proceedings with sangria prepared with striking flair. Each glass is delivered in a small spherical glass bottle to be poured into the glass over ice into which pieces of chopped fruit have been frozen. 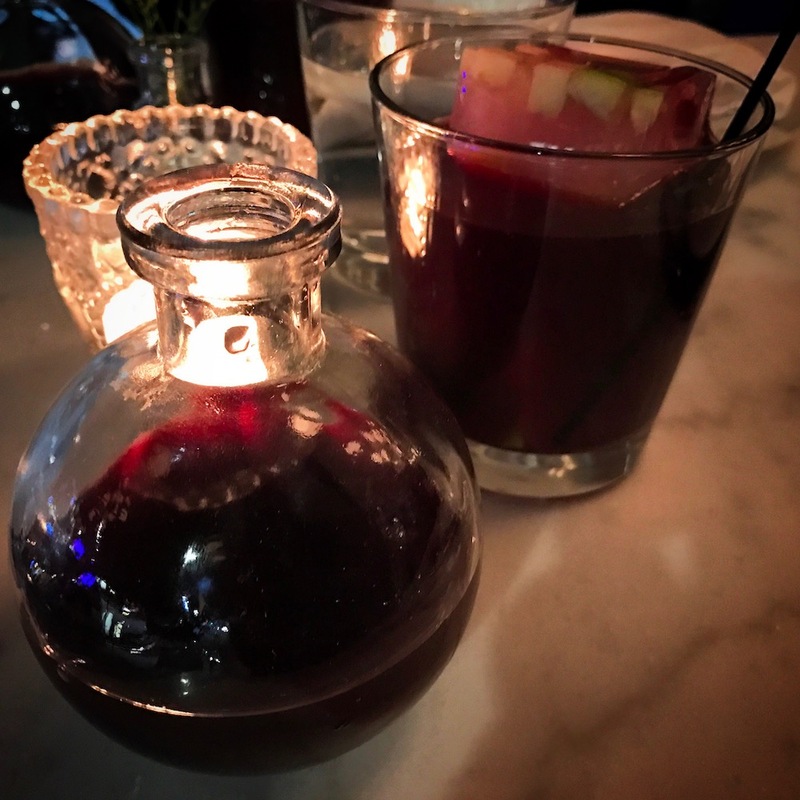 The happy effects are that the ice doesn't melt into the wine sitting in a carafe, and that the melting ice in the glass adds fruit to the mixture as time goes on. A bottle of Ribera del Duero's 2011 Bodegas Arrocal Ángel paired well with dinner, and ended the evening with a glass of Amontillado Sherry. If at $90 the Arrocal is too pricey for your evening (we felt this was a special occasion), consider the Erial from Ribera del Duero or the Teso de la Monja "Almirez" from Toro as by the glass priced alternatives. Each of the thirty-two wines on the list are Spanish, making Joselito one of the DC-area's best places for a well-curated selection of Spanish wine. Our tasting notes are below. The 2011 vintage of the same wine we drank with the winemaker on the steps of his bodega as the sun went down, the Ángel is a higher end selection from Bodegas Arrocal in village of Gumiel del Mercado in Spain's Ribera del Duero. A mix of blueberry jam and bright red stone fruit with a little rough and tumble rusticity and for a highly dynamic nose. There's also a dusting of dark chocolate that turns into a harder dark chocolate, cacao, on the palate. It's cool and juicy, like biting into a juicy piece of fruit. It curiously mellows out while taking on additional structure once opened for thirty minutes. Beautiful balance of rusticity, jamminess, and blueberry accents make this a classic Ribera del Duero that we'd recognize as such in a blind tasting. A nose of crème brûlée fired caramel blends with the ever so slightest hint of cinnamon as we open this bone dry Sherry. Amontillado is by definition very dry, such an ethereal that I always find it impossibly difficult to describe. This particular edition skips joyously across your tongue, and is one of the smoothest Amontillados we've tried. Yes, the great cities are marked by their great restaurants. By our standard, a place of elegance or intimacy that wrap you up inside, and treat you to an irresistible menu of food and drink, Joselito exceeds expectations. It's a special flavor of city vitality that we can't recall experiencing in Washington, DC, and is a perfect fit with some of the other big-on-character restaurants in Eastern Market. We cannot possibly recommend enough.